Our Free August 2018 Birmingham Calendar is Here! Festivals, fun runs and films, oh my! 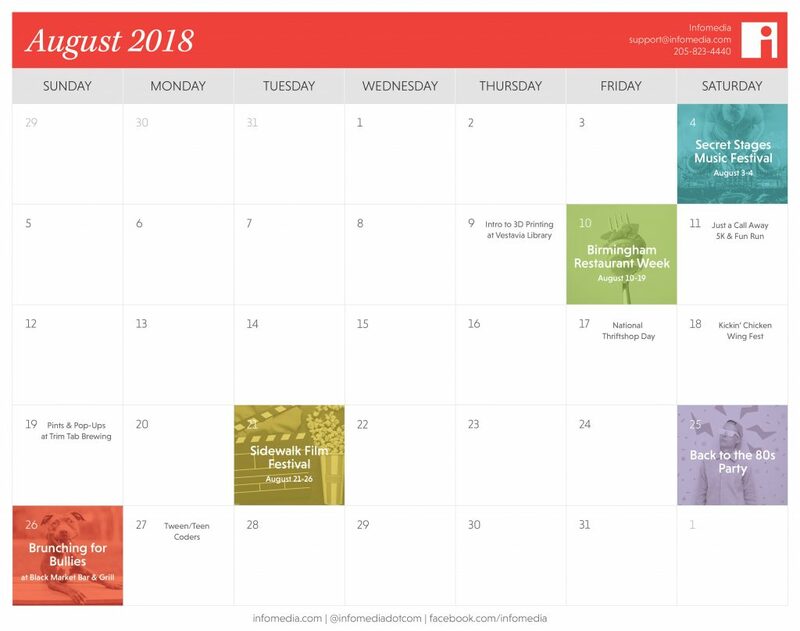 Birmingham has a stellar collection of events happening thisl August, and they’re all conveniently listed on our free downloadable calendar. Grab a copy to keep track of all the fun happenings. This two-day festival was created with the goal of helping participants learn about up-and-coming musical acts. The shows will be at a variety of Birmingham venues all located within easy walking distance of each other, so you can park and walk to multiple concerts each day. Wanting to try your hand at 3D printing, but unsure of where to start? Get an easy introduction by attending the Intro to 3D Printing class at Vestavia Hills Library in the Forest. The best part? It’s completely free and open to all ages. With all of the attention Birmingham’s culinary scene has been attracting as of late, there’s no better time for Restaurant Week to happen. Spanning 10 days and featuring more than 70 restaurants, it’s an event that is sure to have something that fits your tastes. Each establishment will have prix-fixe lunch and dinner menus ranging from $10-$40 that feature the restaurant’s best dishes. The perfect way to see historic Birmingham sites, the Just a Call Away 5K and Fun Run takes runners from Sloss Furnace all the way to the Lakeview district. The event offers a competitive 5K or an easy fun run, both of which benefit the Birmingham Crisis Center, a nonprofit that serves Central Alabama with 24/7 phone assistance for those in need. Get more bang for your buck with National Thriftshop Day. You’re sure to get a bargain at any local thrift store, but some of our local favorites include Lovelady Thrift Store, Vapor Thrift Store and The Foundry Thrift Store. All you can eat wings for a good cause? Sign us up! Hosted at Ghost Train Brewing Company, the Wing Fest consists of a cook off, live music and local brews. The event benefits The Literacy Council’s various programs, such as adult literacy and family literacy. A new event to the Birmingham scene, Pints and Pop-Ups has a focus on keeping things local. Grab a drink at locally brewed Trimtab Brewing Company, shop from the area’s best vendors, sample from food trucks and benefit a community nonprofit, Birmingham AIDS Outreach. Don’t miss out on the 20th annual Sidewalk Film Festival, a real Birmingham staple. The event showcases more than 250 filmmakers and draws a whopping 15,000 visitors to the city each year. Spend the week enjoying independent films and shorts, ranging in genre from documentaries to dramas. Grab your fanny pack and tease that hair, because the 80s are in-style at this Saturday night party put on by Sidewalk Film Festival. Enjoy themed cocktails, costume contests and the ’80s music all evening long. Meet adoptable dogs and have an amazing breakfast at the Brunching for Bullies event. Located at Black Market Bar and Grill in Five Points, where you can buy everything from a Baby Mama Breakfast Bowl to mimosa pitchers, the afternoon benefits Bama Bully Rescue. Have a child with an interest in programming? Sign them up for the Tween/Teen Coders class at the Homewood Public Library. This informative class is open to anyone in grades 4th through 12th with a desire to learn development. Bringing a laptop is suggested, but not required.